Hiab, part of Cargotec, has received the first order for its new MOFFETT E-Series electric truck mounted forklift truck, an E4 20.1, 2-ton capacity model, from Cargomatic, a logistics company in France. The new MOFFETT E-Series electric truck mounted forklift is super-quiet, with a noise level of less than 60dba, and has been designed for applications such as urban distribution in locations where access is restricted and low noise is paramount. The E-Series uses the latest lithium-ion battery technology to power the electric drive motors, hydraulics, and steering systems, meaning that when operational it is totally emissions-free. "Hiab is the first company in the world to manufacture an electric truck mounted forklift powered by lithium-ion batteries, and this innovative product will open up new segments and applications for us," said Jean-Alain Charrier, MOFFETT Product Manager at Hiab. "Cargomatic's prime concerns were running costs, noise levels, and environmental impact. With the MOFFETT E-series, we have been able to effectively address all of these, and significantly reduce them." 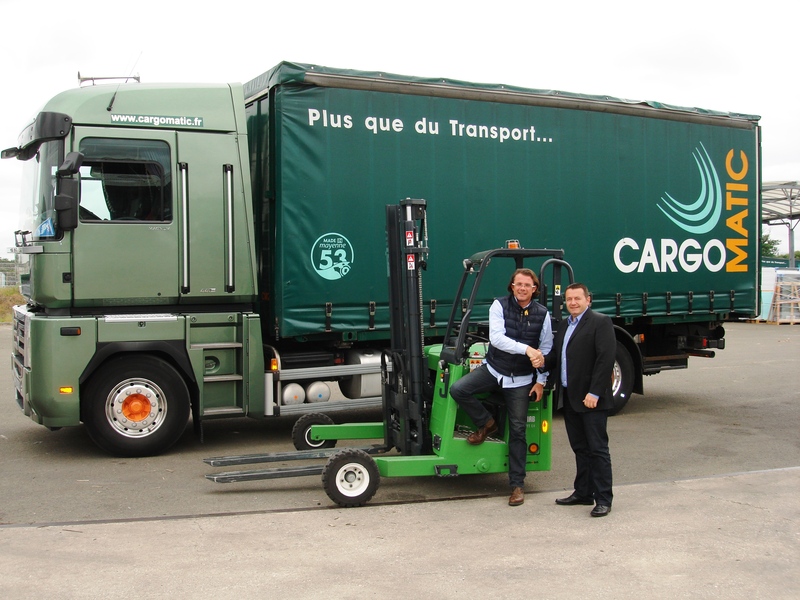 Based in Bonchamp, in the Mayenne, in Western France, Cargomatic is a logistics company expert in sensitive deliveries as well as awkward and difficult to transport cargos. It is an extremely forward-looking company that believes in caring for the environment at every opportunity. "The environment is one of our priorities, and Hiab's new zero-emissions E4 truck mounted forklift contributes greatly to our goal of environmentally-responsible business practices," said Arnaud Deniau, Managing Director of Cargomatic. Cargomatic's business model encompasses a number of innovative and specialised delivery methods. It is the only French operator to offer handling with truck mounted forklifts for direct distribution with receipt of goods in train terminals. In Europe, Cargomatic is the first to want to use a set Eco-Combi 25.25 m with truck mounted forklift, still awaiting accreditation in France. One of Cargomatic's newest innovations is the Greenbox, which is a reusable, domestic-sized container. It is delivered to the customer's property and left for the customer to load, before being collected and delivered to the chosen destination, or placed in storage until needed. It can be used to transport furniture, domestic goods, office equipment, documents, clothes - the list is endless. With a Greenbox, the transportation is managed entirely by Cargomatic for the customer's convenience. Cargomatic has chosen to use the new E-Series electric truck mounted forklift to run this programme because of its ultra-quiet operation and zero emissions. It means that it will be able to operate quietly in built-up residential zones, as well as being able to unload into both indoor and outdoor areas. It will also reduce its running costs by more than 70% compared with a similar capacity standard diesel-powered truck. "Cargomatic is an environmentally-friendly company, and the new E-Series electric truck mounted forklift will complement their business model - minus the CO2 emissions. They are setting a great example by investing in leading-edge technology, which will not only benefit the environment, but also their profits," said Michael O'Reilly, Product Manager, TMFL Product Business, Hiab.